The camera looks at—and out of—buildings, but seldom really inhabits them. It’s an obvious problem; how do you express the three-dimensional quality of space on a two-dimensional screen? I pose that question to Director Joseph Clement, whose new documentary, Integral Man, proves one of the rare exceptions to the rule. 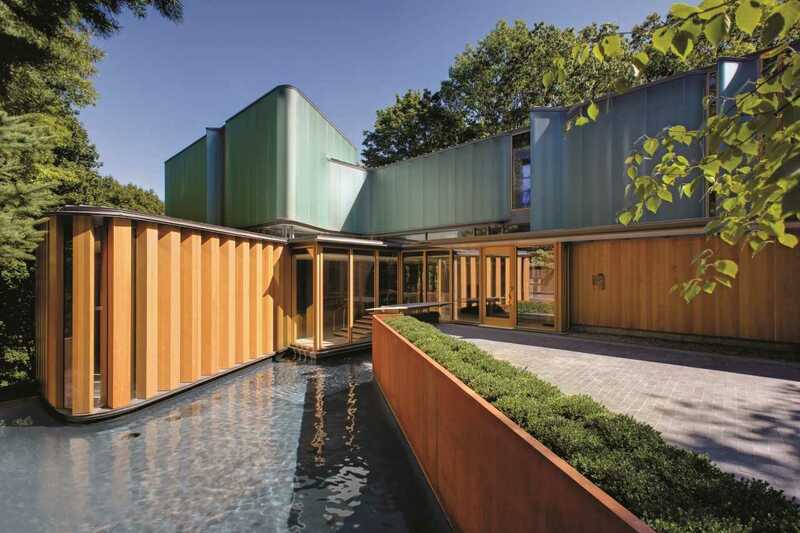 The film is a window into the life of mathematician James Stewart, whose final years were lived in Rosedale’s Integral House, an 18,000 ft² contemporary masterpiece designed by Toronto’s Shim-Sutcliffe Architects. “Light is in some ways almost the subject of the film,” Clement explains, describing the attention to detail—facilitated by the use of light-sensitive 35 mm film—that defines Integral Man‘s aesthetic. Trained as a landscape architect, Clement’s aesthetic intelligence is evident in each frame. The camera takes in the view slowly, panning across the famous curves to capture the interplay of light and shade across the white oak fins that frame the unobstructed interiors. The man behind the house is James Stewart, a mathematician, concert violinist, and longtime McMaster University professor, best known for publishing a near-ubiquitous series of calculus textbooks. It was the revenue from the books—which reportedly saw Stewart become the most-published mathematician since Euclid—made the $32 million dollar house possible. 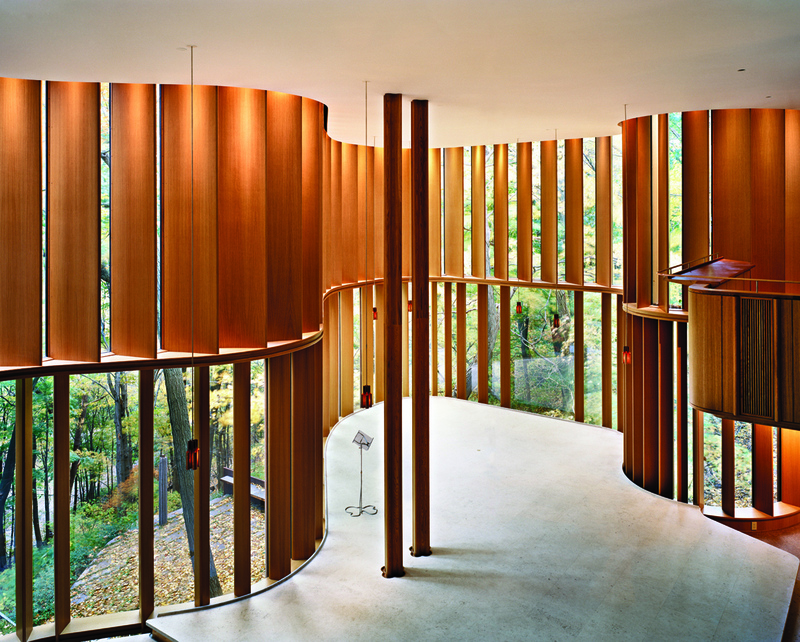 Stewart sought to build a house that would nourish his love of both music and mathematics, outlining the specification that the property should comfortably host a concert of 150 seated attendees—and that it should have curves. “Jim spent three years traveling the world in search of an architect,” says Clement, with world-famous names like Frank Gehry and Rem Koolhaas showing interest in the project. But it was Toronto’s Brigitte Shim and Howard Sutcliffe that impressed most. 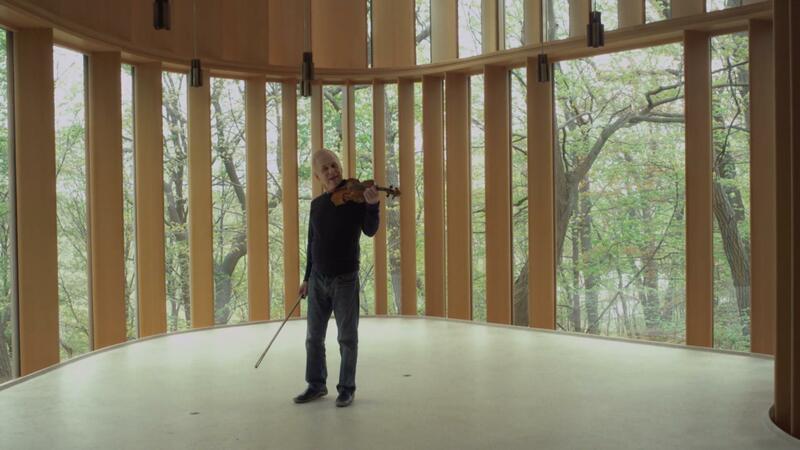 The curves, as it turns out, make the concert space a near-replica of a violin’s interior, Clement adds, explaining how Stewart and Shim-Sutcliffe’s vision is carried through to the smallest details. Intentionally or not, the music of geometry and curvature is everywhere. Framing the interior, nearly 100 white oak fins that grace the walls are each carefully angled to temper the light, with the spacing varied in response to the curvature of the glass. Free of visible power outlets—”Jim hated them”—throughout the living spaces, the wood of the fins carries through all the way to the kitchen cabinets as a design element, make for a unified aesthetic. 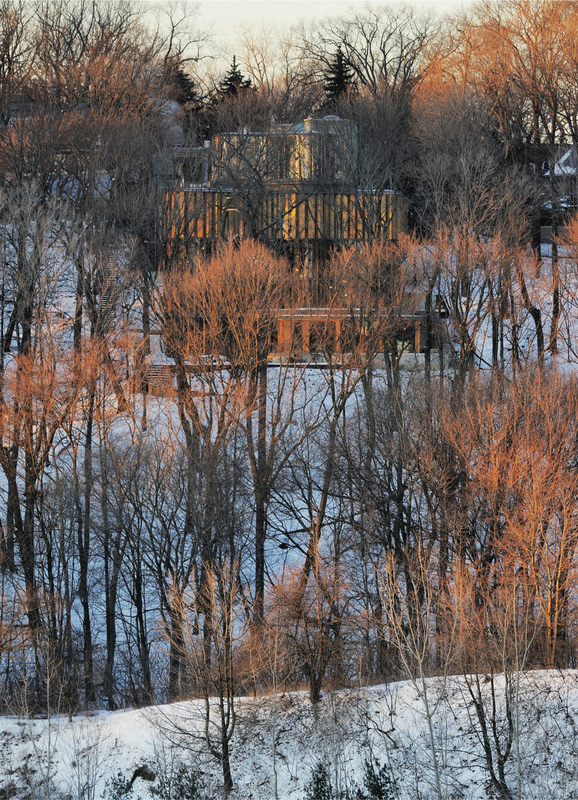 “Depending on the time of day and the season, the light is very different,” says Clement, “which changes the nature of the space, and the experience of being there.” Clement’s architectural eye translates well to the screen, and the 35 mm camera capturing the rich but subtle changes in texture throughout the day and year. Part of that quality comes from the choice to shoot in film, but the technology would mean little without Clement’s well-tuned architectural sensibility, which finds the grace notes that play out across all that light and wood. The design took Shim-Sutcliffe eight years to perfect, with the two-storey street level opening out to a performance space that looks out over the ravine. There’s also a home office and a library, alongside an indoor pool and spa space on the uppermost floor. It’s all undoubtedly luxurious, but Shim-Sutcliffe’s understated style resists the ostentatious — and sometimes utterly graceless — character that defines too many of Integral House’s Rosedale neighbours. “That was Jim,” says Clement, “he was a really down-to-earth sort of guy, and if you met him, you might not realize he was also so intensely and passionately driven.” That part of his character, Clement tells me, only became apparent as you got to know him, emerging from the unpretentious street level to the subtle yet spectacular concert spaces below. As the film begins to unfold, the passion becomes apparent to us too. All the while, the complex links between music, math, and architecture, are lucidly explained by Stewart, who addresses the camera with the quietly compelling charm of a beloved old professor. Then comes Stewart’s fatal cancer diagnosis, and a film about architecture, music, and mathematics, poignantly stumbles into elegy. Stewart’s voice stays with us as his body quickly declines, handling the new reality with uncommon grace in the telling, as Clement does in the showing. The quiet, reflective shots now take on another emotional register, imbued now with the sense of an ending. Taking up his violin for a last time, Stewart finds himself unable to play, as the cancer robs him of his music. “Even when he got very sick, his enthusiasm for the film never waned,” Clement stresses, “and there was never question of not finishing it.” That sense of bravery and resilience carries the film through to its conclusion, which—despite the circumstances—comes as a sort of bittersweet celebration. Integral Man culminates in what the 73-year-old Stewart calls a “living wake,” where the impresario joins his concert-going guests to revel in the refined and devastating power of Measha Bruegergossman’s soprano. By then, he was close to the end. But standing in his house, surrounded by people, surrounded by that reverberating voice, and surrounded by the mathematical and musical beauty of the space, you get the sense that he felt nothing but alive. Integral Man will be screened as part of the Toronto Design Offsite Festival (TO DO) on January 21. The screening will be followed by a panel discussion featuring director Joseph Clement and architect Brigitte Shim, as well as Aaron Davis and Gaëtane Verna.